Q: Can My Dog Go Vegetarian Or Vegan? That's the good news for any vegan or vegetarian who wants to ensure a beloved pup gets the nutrition it needs. It's also good news for those who are just really interested in eating ethically, and object to the ingredients in many dog foods, which can contain slaughterhouse offal (byproducts of cattle, pigs, chicken, and lamb) or other meats that you'd never touch. But that's not to suggest there's no debate on the subject: Some veterinarians still worry that a meatless diet -- usually made from some combination of soybean meal, mashed vegetables, and synthetic vitamins and minerals -- may not be an adequate substitute for one with meat. And when we contacted the American Veterinary Medicine Association, the leading organization of vets, a representative wrote to tell us that "the Association doesn't have a policy on this issue." "It is OK for dogs to be fed a vegetarian or vegan diet -- with the caveat that they are correctly balanced," Farcas says. But this caveat is critical: While dogs technically canget all of the nutrients they need from meat-free sources, it's more difficult to formulate a complete plant-based diet than a complete meat-based diet. And as far as veganism goes, Farcas says that it can be done, but it's just one step harder. Often, some of the vitamins in dog food, like vitamin D, come from lanolin, which is derived from wool -- therefore technically an animal byproduct, a vegan no-no. But these nutrients can be produced synthetically. "In the end, a well-formulated, high-quality vegan diet for a typical dog can provide adequate nutrition just like a well-formulated high-quality meat-based diet, though it is easier to make the meat-based diet with a larger margin for error and safety." So it's physically possible to feed a dog a meat-free diet without any adverse effects. 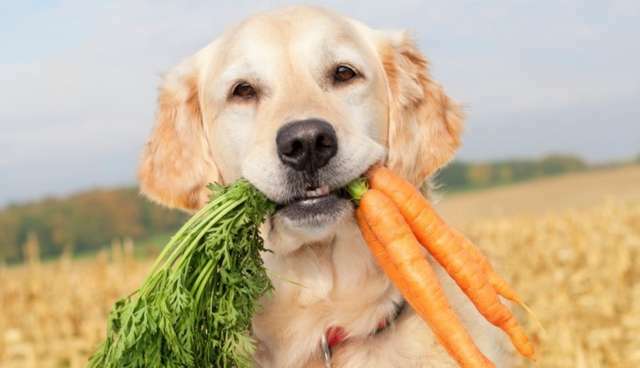 But should your dog go vegetarian or vegan? What if you prefer to make their own home-cooked, vegetarian or vegan dog food? That's trickier, Farcas says. "In the worst case scenario -- since vegetarian diets are harder to formulate -- it may be harmful to dogs." She recommends making a homemade diet only if you work with a veterinary clinical nutritionist who is listed asa diplomate of the American College of Veterinary Nutrition. Will your dog even like vegetarian dog food? The NRC report suspected not, saying, "Though many dogs may prefer animal-based protein, they can thrive on a vegetarian diet." On the other hand, we force ourselves to eat things we know are good for us or for the planet, even if what we really want is a meatball sandwich. It's OK for dogs to do that, too.